Good e-Reader has exclusively learned that Onyx Boox plans on launching a digital signage solution sometime in 2019. The company is going to release a 42 inch and 31.2 version and the naming convention is tentatively called Boox Signage. 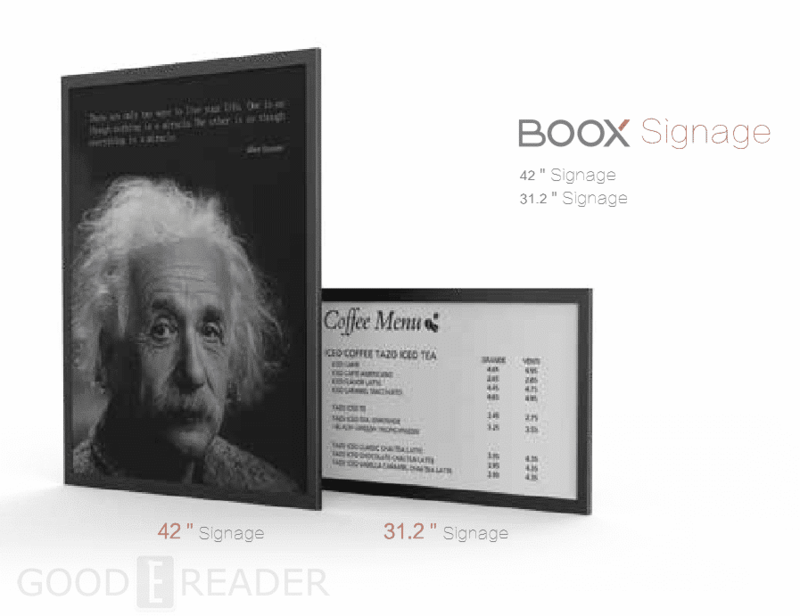 Boox Signage will feature an E Ink screen and it remains to be seen if they will use Mobius or Carta. The 42 inch screen will have a resolution of 2160 x 2880 and the 31 inch screen will have a resolution of 2560×1440. They will be powered by a Quad-Core 1.6 ghz processor the exact amount of RAM and internal storage is currently unknown. These devices will have an SD Card, HDMI, USB, RJ45 connectors. They will also employ stereo speakers and a microphone. Onyx has developed a special Android 6.0 launcher for their digital signage solution. It will put an emphasis on displaying high resolution content. They plan on marketing these products to cafes, restaurants or the business environment such as meeting rooms. I believe that these products are best suited for indoor environments. Onyx Signage will be competing against Visionect who does a mixture of retail and business, but also focuses on the outdoors with their bus stop solar panel solution. There is no word on price, but E Ink is selling one of these 42 inch screens for $2,500 each. I think it is very interesting that Onyx plans on branching out from e-readers, which traditionally was the only thing they ever focused on. They developed a few prototypes over the years that never saw a wide retail release or were cancelled, such as the Onyx Phone or the Boox Typewriter. I know that implicitly it’s conceived to show static images, but as Dasung has demonstrated, it’s possible to play video on a e-ink screen. So, could this product be offered with a quicker image transition? It could be awesome as your main screen in your own productivity setup, where the big majority of your work is done reading webpages, pdfs and writing code and documents. The well being of your retina will offset any initial high cost. In my current PC setup I use a 49″ 4k LED Tv, which gives me an area only doable with 4 big monitors which would consume twice the electricity. I am very happy with my videowall setup, but I have to be very careful with the eye strain and retina deterioration by blue light. Branching out from e-readers? 31 inch screen with a resolution of 2560×1440 is good for 2 page sheet music (side by side) in landscape mode. But it would need to be somebody’s else epaper, not EInk’s which are too expensive.